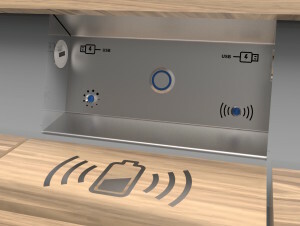 The CapaSitty bench provides USB ports for charging smart phones as well as an innovative wireless induction charging system in QI standard. Simply place the phone on the icon for wireless charging and solar energy will charge the phone’s battery. The current list of mobile phones which support standard QI can be found HERE. Wireless charging is without doubt the standard of the future. The CapaSitty bench is future-ready.